Royal life includes luxuries most children can't even imagine, but there's good news for kids who want to play with a toy fit for a (future) king! You don't need a palace to appreciate Prince George's favorite plaything — in fact, you probably already own it. Prince William paid a visit to McLaren Automotive's headquarters in Woking, England, Tuesday and revealed the 4-year-old loves Legos. "My son would love this," the Duke of Cambridge told CEO Mike Flewitt as he looked on at a McLaren 720S sports car made entirely out of the tiny plastic bricks. It took 280,000 bricks to create the impressive model. "Wow! My son’s very into Lego, and he’d love this," William continued. "It’s incredible." Of course, things aren't all fun and games for George these days. 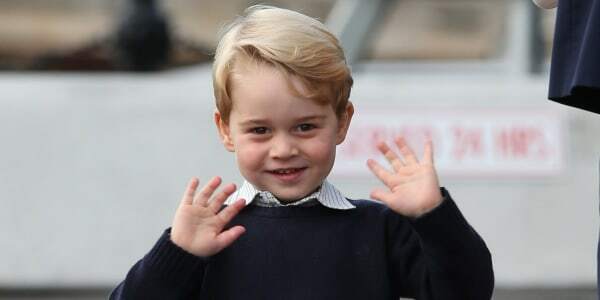 Just last week, the monarch-to-be attended his very first day of school. Dad was right by George's side as they made their way to Thomas's Battersea School on Thursday. The tyke looked a little apprehensive in some shots from the big day, but he was sporting a playtime-worthy smile on the steps of Kensington Palace before they set out. As for William's favorite toy, the 35-year-old told Flewitt he prefers automobiles — the kind that aren't made of Lego bricks. Prince George, the adorable son of Prince William and Duchess Kate, continues to mesmerize the world. But that's not all he looks for in a sweet ride. "The key question is: Does it have a coffee cup holder?" he asked. "It may be a fast car, but does it have a coffee cup holder?" We don't know what sets Prince George loves to play with exactly, but here are the top rated sets from Amazon.